Last Friday, we had 17 people over for dinner. No, we haven’t moved to a larger apartment. No, my kitchen hasn’t grown to the size of a normal one (though some mornings I tiptoe in, hoping it will surprise me). No, I hadn’t really expected almost all of my friends to be able to make it when I invited them, but I wasn’t the least bit sad when I found out they’d all come, mostly because my vision of the ideal apartment gathering resembles the party scene from Breakfast At Tiffany’s. And boy, we get closer every time. The precursor to this was when, about a month ago, I moped, as I often do, to my husband that we never entertain anymore and that we should just do it, just throw a party and have enough aperatifs around that pesky details such as cranky child up past their bedtime and who needs chairs? pull up a corner of carpet to sit on! and oops, did we invite more people than we have forks for again? would cease to matter. Wine solves everything, doesn’t it? My husband was less confident, so I decided to tackle the roadblocks, one by one, like an adult. (Boring!) It turns out, we actually have a lot of plates and flatware because my mother once gave me the sound advice to always buy or register for more than you think you’ll need (your friends will thank you). But the other problems were still fairly easily solved. For example, not enough table space? It turns out folding tables are inexpensive and can be hidden surprisingly well under the sofa. Not enough chairs? Ikea is so on that, guys, and they fold so flat, I couldn’t even find them once my husband put them away (whether or not he didn’t just put them at the curb is a question I decided not to ask). And then I got carried away and even bought our very first tablecloths, and some tea light holders. Instant Dinner Party Kit! Guys, as if a sign from above (or just, the publishing gods) their recipe was in The New York Times dining section this week. I mean, yesterday. As in, I read it, shopped it, and we were drinking a glass at home after the kid went to sleep and before the paper even became birdcage liner. The Pata Negra sangria may not be for everyone; it’s barely sweet (although you can add more sugar) and has a longer ingredient list and bigger yield than what you might be used to. So, in the interest of making everyone happy (which is really what entertaining is about), I am also going to share Susan Spungen’s simpler simple one below, slightly sweeter (but still not oppressively so) and a more reasonable volume for those times when you’re entertaining fewer than 17 people. But really, where’s the fun in that? * Can we talk about the fruit for a moment? I have questions! Why isn’t sangria ever served with a spoon or fork so that you can eat the fruit? I never know what to do with this deliciousness in the glass, short of reaching in and making an undignified mess. Are we really supposed to pretend it’s not there and wouldn’t be insanely delicious to eat? I am eager to hear your Sangria Fruit Management techniques. The first recipe is a classic, not very sweet sangria with a moderate yield and a minimum of odd ingredients. It’s the little black dress/white oxford of sangrias. Susan Spungen recommends trying it with white wine instead of red in the summer, and adding peaches or berries too. The second is the one we fell in love with at a small restaurant in our neighborhood. 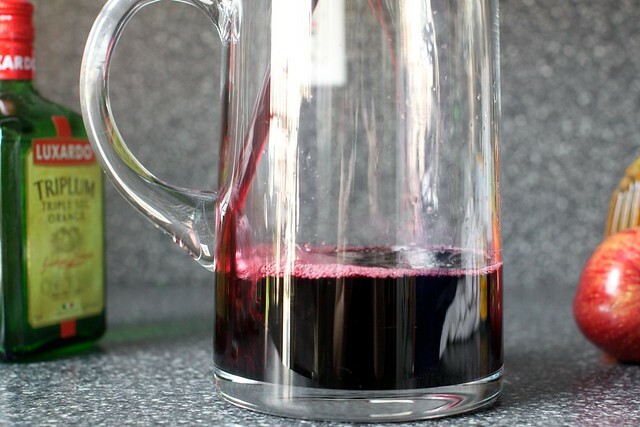 It’s much less sweet (it has barely a pinch of sugar in it, though you can add more), and tastes mostly of wine, with a little pep from fizz, and it makes a whole lot. Rose is added to lighten the mixture. The chef, Rafael Mateo, recommends you let it “knit” together overnight, and only adding the fruit to each glass to serve. From Susan Spungen’s What’s a Hostess To Do? Mix the wine, sugar, brandy, liqueur and orange juice in a large pitcher. Add fruit and let sit in the fridge until needed. Add some sparkling water (if using) right before serving. A slotted spoon will help guests hold back the fruit while pouring their glasses, and spoon some on top if desired. In a large vessel, combine wines, liqueur, brandy and sugar. 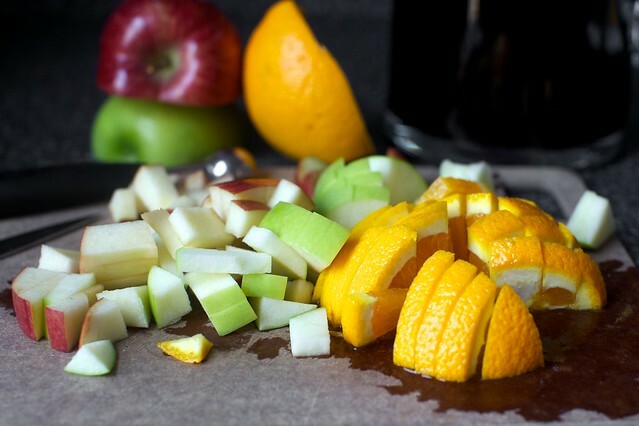 Mix fruit and set aside. Right before serving, pour in soda. Fill glasses with ice, and pour sangria over. Garnish with fruit. Beautiful sangria, definitely need to try this. Perfect summer drink! Oh sangria is definitely happening this weekend (we have an abundance of produce and sometimes fruit salad just doesn’t cut it). I can’t believe you had 17 people! That’s impressive. We find that when we invite too many people we just hop into the “prop room” and grab some extra forks and plates. I loooove sangría! I definitely let the fuit “soak” in the liquor over night, it tastes better. I’ve also tried making it not with brandy, but with some really good quality dark rum (such as Zacapa Centenario) and it was so good! I’ve never tried it with berries, will do! I’m totally crashing your next dinner party:). Everything sounds amazing! *Almost* as classy as reaching in and grabbing the fruit out of the bottom of the glass, I kind of schlurp bits of fruit into my mouth with the sangria while I’m drinking it. I like to think it’s subtle. I’m sure it’s not. Alternatively, if the sangria is served with a straw, and depending on venue and/or how much sangria I’ve already consumed (more sangria = less concern), I’ll stab pieces of fruit with the straw and eat them that way. Helpful, no? Having a cocktail party in June and this might have to be the focus! 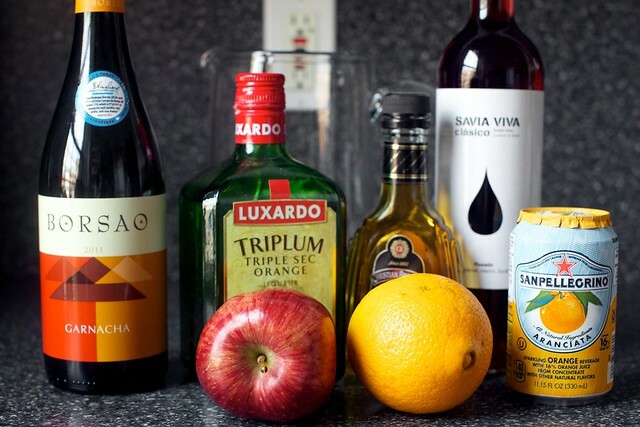 I’d also like to do a white sangria — do you just sub white wine for red and keep everything else the same? Before the secret was divulged, this stuff was promoted as an incredible treat. I know it sounds bad, just looking. But it is really much, much worse than it sounds. Much. Great post! I love making Sangria for parties. Growing up in Spain and going back to visit, there is always a big spoon in the pitcher to get the fruit out into the glass. At the end of the drink, or several, tossing back the sangria fruit into your mouth is the special reward! Once we did not have any selzer on hand so we decided to add some cheap champagne to cut it. Tipsy decisions are sometimes the best and now it is a running joke. We segment (supreme?) oranges first so you can tip your glass back and eat the fruit chunks without sticky fingers. I can’t wait to try these versions! Sangria is the best. I work in a restaurant that is only open a few days a week. Rather than wasting all the open wine on Sunday nights, I make Sangria. Whatever bar fruit is left gets soaked in coconut rum and added along with the pelligrino orange before service. Even the guys like it! If you want to make the sangria slightly sweeter (but still not cloyingly so! ), I love including apple brandy instead of the regular or Spanish brandy most recipes call for. It’s a little sweeter and you get even more fruit flavor. You can use apple jack or actually make your own (recipe linked above). LOVE this!! We are having a Memorial Day BBQ on Saturday. I had a plain Jane sangria recipe…. That will be updated with this one now! :-) thanks! I am from Spain and my Dad used to make a great sangria with Peaches, oranges and red wine…soaked overnight. The peaches clinch it…must wait until July though, to get the perfect fruit! Okay, now I’m definitely going to throw a dinner party. People may have to eat off a desk, but you’ve inspired me. I love sangria. I just want to mention to any fellow persons with diabetes (T1, represent!) that I’ve made a very similar recipe to the Pata Negra one, but with Fresca instead of Aranciata. I don’t mean to be a heretic, but it’s really surprisingly good. I don’t think anyone could taste the sugar fake-out. Obviously, there are always substitutions that can be made. I’m just pointing out a particularly good one. For even better result, let it stand in the fridge for 24hrs before serving it! A delight!! It sounds silly, but while I can put together a grand French meal, or an authentico carne asada for a crowd, I’ve always failed at concocting sangria. It never comes out quite right. I love options and, now, I have two. Thanks. I recommend bamboo skewers to solve the snacking/ undignified mess issue. I pre-soak the skewers with fruit in the hard booze, throw the skewers into the pitcher before serving, and ta-da. What a spectacular idea to skewer the fruit! I will try this and pass this great idea along to my friends and beyond. THAT YOU! Sangria season is finally upon us and we made our first (hybrid) batch this past weekend as well. Your post is both refreshing and timely! I’m looking forward to trying some of the variations you write about and for the record, I always serve my sangria with spoons! BTW, I envied your guests, I’m sure it was a wonderful gathering. Gosh I love Sangria!! So dangerous though! I’m all about sangria in the summertime. Can’t wait to try the second version! I wish places would serve sangria with one of those! Sangria fixes all, including tiny apartments! Also, good call with the chocolate chip cookies, no one needs a big cake after that awesome meal you described! I love a good sangria!! And that’s awesome you had 17 people over. It’s the joy of just having your house buzz with people that’s totally worth it. I loved your reference to the two lasagnas. That’s what I served my family this Christmas, for my first ever time hosting it. Everyone loved them both, obviously. I read the Times piece about sangria yesterday and was planning on making some this weekend, and with an extra endorsement from SK, how could I not? I have the same thought about how to eat the fruit in the sangria and I’m thinking crab/lobster forks may work well and not be too big, and double as a stir stick? Also, with the kickoff to summer this weekend, thanks for sharing your hostessing tips! Okay I have to admit, I’ve never really tried sangria. I will need to rectify this immediately. And now I have a wonderful recipe to do so. I love that you just wanted to go for it, that’s what I would do, too. But my husband sounds like yours-I would need to fix all the things that bugged him and buy chairs, etc. first. I love that you guys had such a fun party though! So inspiring. Thanks for sharing what you made-I always get stuck and just end up giving up! This is sweet, but a lovely summer peach white wine sangria! First of all, I’m eager to get Susan’s book. I’ve never hosted a dinner party completely on my own. And yes, I am always looking undignified because I love digging the fruit out of the sangria! Actually, for the last spring holiday dinner party, I took four of your recipes (3 I hadn’t made before) and they were all a hit! I posted about two of the four so far, and will eventually post about your fabulous brisket and mustard potatoes. Someone gave me a set of cocktail forks as a housewarming present and I have found a million uses for them. They would be perfect for sangria. I love these recipes; I will definitely be trying them for Memorial Day weekend. And you have to be careful eating the fruit, depending on how long they’ve been soaking up alcohol…a friend of mine once had an unanticipated amount of drunken debauchery thanks to eating too much leftover sangria-soaked fruit….needless to say, when I offered her bagels and juice for breakfast the next day she refused the orange juice. Kudos to you for hosting 17 people. And, bonus that you can do a little maneuvering and that sangria can become mulled red wine for a winter soiree. One thing about sangria that always gets me though: The citrus always seems to get bitter on me after a little bit. I usually only host a big group for Thanksgiving. But I’ve been thinking about doing another big party in between. A summer Thanksgiving if you will. These sangrias would be perfect! I am a genius, I just served sangria at a too big for our small house party last weekend! I just grab a fork and eat the fruit, lest end up with wine stained fingers. HELLO! I’ll take one of each! I can’t imagine having 17 people in my apartment! You did well! Oh, I want a huge pitcher of sangria right now. My favorite recipes for it are by Jose Andres – they’re only barely sweet (no added sugar, just a little bit of orange juice), have tons of fruit, and are very flavorful from the tempranillo wine. He also adds just a smidgen of ruby port, which I swear works magic. Funny story about the fruit remnants from sangria (you’re right – why in the world are we forced to ignore them? they’re delicious! )… My coworker took 2 pitchers’ worth of that boozy fruit home and proceeded to get drunk off them the next day. Waste not! Alright Deb, here’s what I would like to know: with your tiny kitchen, where in the world do you keep all of your non-necessities- 2 pitchers, your neverending assortment of bakeware, place settings for 17!?! (I think I have 6 tops). My kitchen about your size and I’m constantly jamming things together (and making my OCD self very miserable). What is your secret? Is much of the stuff borrowed? By the way, that Pata Negra sangria looks amazing and thanks for the great dinner party tips. I love your brunch tips as well. Kathryn — We don’t keep our dishes in the kitchen. We keep them in a china cabinet in the living room. (There’s also a spillover stack of serving dishes… working on that this week!) It was a bit of an investment (we didn’t to get one we might hopefully want to have forever, i.e. until we might actually put wedding china in there) but makes the kitchen 400% more usable, because we only stash “ugly” things in there (ingredients, bakeware). More tips here, although the photos are from an older kitchen (that was bigger, sob). I had a sliced and seeded serrano chili to my sangria. Gives it a nice bite. Sounds like a fantastic party! I love that orange soda in sangria that’s how we had it in Spain. Here’s a trick I love when doing large parties with lots of dips: if the bakery slices bread ask them to put your baguette through the slicer – they often have to cut it in half first so it will fit. Then they can bag it in the plastic they use to bag fresh cliced loaves of sandwich bread. Then you get perfectly even slices of baguette in minutes! I’m just happy that there’s someone else in the universe who has invited over more people than they have forks. Mmmmm sangria. I’ve never tried to make my own before, but this summer (if it ever gets to BE summer her, screw you, Belgian weather!) I will have to try it. Sidenote: I can’t believe you don’t serve it with a spoon! Around these parts (which is to say any part of Europe I’ve had sangria, i.e. Belgium, France, UK, The Netherlands and I think Italy, but I can’t quite remember that) it’s always served with a straw and an extra long spoon for easy fruit accessibility. I say it’s totally fine. You can be a trendsetter! I love Sangria. It’s one of my favorite cocktails to make for parties! I serve it with little bamboo skewers so people can get at the fruit at the bottom of their glasses. Because that is the good stuff indeed! The best part of sangria is the boozy fruit! In winter we mull wine, but summer is all about sangria. Oh yes I’m THAT SLOPPY Sangria drinker! Yes indeedy! I reach my hand into my glass – so unladylike like and eat that booze laden fruit! Heck the fruit alone can make me drunk! I think I’ve set out tooth picks at my summer Sangria parties if I remember correctly – but when I’m out … not so much! CHEERS to summer and many more Par-tays! Sangria sounds delicious! Such a great summer drink, and perfect for summer entertaining! Breakfast at Tiffanys – favorite movie. Need to watch it again. I also really need to make your escarole salad. Made your zucchini ribbons with almond pesto from your book this week and it was delicious! I agree that Sangria should be served with a mini dessert/cheese fork. Why let perfectly good and yummy fruit go to waste? I certainly don’t. Thanks for the sharing the recipes and glad to hear that the dinner party was a success! I love the idea of adding lightly sweet orange soda right before serving. That sounds delicious! Was one recipe of the Pata Negra Sangria enough for 17 people? re: fruit management, I just try, inelegantly, to spear as much of it as I can on the tip of my cocktail stirrer. It’s a fun challenge. this post makes me want to throw a dinner party. and drink sangria. right now. but alas, it is thursday at 2:30, i’m watching Dora with my daughter, and juice boxes are the drink of the moment. but soon… soon there will be sangria :) thank you! The site, the recipes, the photos – all great! Keep on being you! Thanks for this wonderful post, for making me remember how to throw a crowded party in a tiny apartment (20 people in a Manhattan studio 10 years ago before I was quite the grown-up I am now- lovely time) and for a very timely inspiration just before a long weekend gathering. Also, as disgusting as it may sound, catching pieces of fruit from a sangria glass after the wine is finished is the most delicious way to go. That’s why I serve sangria in wide mouth thick glasses. Ahhh quite correct – wine does solve everything! A great tip that I learnt in Portugal (not Spain funnily enough!) is to use honey as the sweetener in place of sugar. It adds a great extra depth of flavour. A month ago I sat in an eye-wateringly stylish tapas bar in Granada eating razor clams. The bar was a frenzy of activity and the only drinks served were cerveza (Spanish beer) and sangria served in short wide chilled glasses without fruit. Reading your post made me want to jump on the next plane. I like the sound of the whole menu! 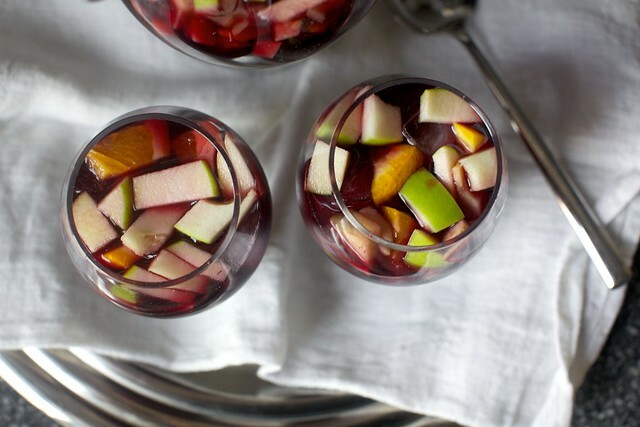 Sangria is so perfect for a dinner party. Great advice on it all- thanks! oh my, i want your glasses and pitcher. can you share the source? thank you. Sangria is a drink and a snack. I can’t stand the thought of leaving behind perfectly alcoholic fruit. To me, that would be like getting a martini and not eating the olives. My favorite sangria is a cava sangria I had at a restaurant that included mint, jalapenos, grapefruit, elderflower liqueur, and blueberries. I’ve made it at home and it’s always a hit. Love sangria. I am with you, I don’t like it too sweet. I am going to tuck these recipes away for our summer parties! Love, love, love sangria!! I serve it for entertaining often. And I’ve found that iced tea spoons, with their extra-long handles work beautifully for getting to eat the fruit in a dignified manner, that is if you’re serving in taller glasses like high-balls. Never underestimate shrimp forks if you’re serving sangria in shorter, tumbler glasses or wine glasses. They work quite nicely and look pretty too. I really think sangria should be served with one of those spoon/straw contraptions that come with Italian ice from a street cart. Drink the sangria through the straw, and when it is gone, you have a totally dignified (well, as dignified as a neon pink plastic straw can be) was to access the fruit at the bottom! I just eat the fruit in an undignified manner and end up a mess. The worst was probably when they decided to mince the fruit and I used two cocktail straws as chopsticks. Also challenging is when some chunks are just fruit AND some have peels so you have to get your hands in there to tackle the mixed bag. Go after it, girl. The Booze Fruit is the best part of sangria. I just love the way you write. It makes me so darn happy! Deb. Vanilla ice cream on the side with the freshly baked cookies! Otherwise, sounds just about perfect. CM — Not a bad idea at all. I was thinking Bourbon* Chocolate Chip Cookies + Milk Punch, but of course, my brain always goes there, doesn’t it? * I bought some bourbon smoked sugar in Kentucky and I can’t even begin to describe how amazing it smells. I replaced a couple spoonfuls of the white sugar with it. My mother’s family is from Argentina and so grew up with Sunday Asados (bar-b-q). In the summer, as the first sausages go on the grill to be eaten on small baguettes with home made chimmichurri as appetizers while the main meats grill, bottles of very cold white wine are opened, poured into pichers and ripe juicy peaches are sliced right in. This delicious, refreshing, simple Sangria is known as Clerico and it is summer in a glass, and the color imparted by the ripe peaches is spectacular. p.s. I tried to post the question earlier, but had a system (i.e. operator) failure as I was posting. Please forgive if it shows up twice. Peel the orange in one continuous spiral. Drop the peel in the pitcher. Slice the fruit and drop that in the pitcher. Do the same with the lemon. Mash up the fruit some with a wooden spoon. Open the two bottles of wine. Take one in each hand and pour them into the pitcher. Take the sherry bottle in one hand, the brandy bottle in the other, and pour a generous splash of each into the pitcher. Say 1/4 to 1/2 cup of each, if you’re measuring, but that kinda takes the fun out of it. I just learned the recipe by watching them make it. For the still wine, I like to use the wine that comes in a fish-shaped bottle, but sometimes it’s hard to find. You can adjust the sweetness by your choice of sparkling wine. I used to make this with spumante, which is pretty sweet, but nowadays I go with prosecco which is usually somewhat more dry. lovely, thanks for the recipes! this is weird but bananas are excellent in sangria too – they aren’t as pretty but the way their sweetness melts into the sangra is divine! Sangria Fruit Management techniques: a long handle plastic tooth forks added to the glass. I add apples (red & green for flair), watermelon chunks, orange, lime & lemon slices and peaches if I have really ripe ones avail to me. My liquid is a good Spanish red, fresh squeezed OJ, an oz of Brandy, 1/4 c. simple syrup, splash of lemonicello. If I make it four hours ahead of enjoyment the fruit infuses beautifully on the kitchen counter. I only add ice to the glasses and the pitcher tastes even better day after day up to a week-so I make a big pitcher to enjoy all week or make well ahead of entertaining guests! I’ve always thought sangria should be served with a skewer or cocktail pick or something so that I can stab the fruits and eat them once I’m done drinking. It’s just *wrong* to leave that lovely fruit to languish! I love making sangria and yours looks wonderful! What lucky friends you have who were able to enjoy this! A latin fusion place down the road from us in Stamford makes AMAZING sangria. I just use my long finger nails to spear the pieces of fruit left over. I’m classy like that. thanks for these! always looking for good guidelines for sangria. FRUIT MANAGEMENT: i like to boil down the fruit at the end of night (also a fun tipsy task) and make a compote. when it cools it’s nice and thick, just the right consistency and flavor to eat over waffles the next morning. i add cider-type spices also (nutmeg, allspice, what have you), which brings out some good flavors in there. it ends up still having a red wine-y ness to it, so might not be best for the little one. This looks so incredible. I am a big fan of classic sangrias! I’ve seen some mentions about putting out toothpicks for the fruit, but I like to make fruit skewers for the garnish. Just stab a line of fruit all the way along the length of the picks and set them on the side for folks to add to each glass. This way, the fruit is really easy to munch on after the booze is gone (no awkward harpooning of soggy fruit at the bottom of the glass). I also like to add frozen grapes or berries to my skewers to keep the sangria chilled in hot summer weather. I am very, staunchly, pro-undignified mess method when it comes to eating the left over fruit out of a glass of sangria. My first sangria was at a house party in college. One of my friend’s roommates made a colossal bowl of fruit salad and poured about six bottles of three-buck Chuck on top and some cheap orange liqueur. We dished up with a soup ladle into plastic cups, and snacked on the boozy fruit with forks before drinking the remaining wine in the cup. Divine! Someday we’ll do this for a party at our own place, but with Ikea juice glasses & cocktail forks, methinks. I LOVE Sangria! It’s the only cocktail I order when we eat out. I also make it pretty much like the first one you feature. The only difference is, I use a touch more sugar and I macerate the fruit with the sugar for about 15 minutes or so before adding the fruit to the pitcher. I think it brings out more of the juices than just stirring the fruit into the wine mixture. For the last several years Sangria has been my go-to summer drink. In fact, summer doesn’t officially begin until I have a pitcher of Sangria in the frig. All my friends know that ALL summer long there is a pitcher waiting for them to drop-by and enjoy while sitting on the deck, talking about nothing. I am always on a quest for a good Sangria recipe. These look great…I can hardly wait for the weekend! Sangria is my favorite drink for any party! It’s light enough that everyone drinks it, but still packs a punch. It’s so easy to make seasonally relevant as well. The second recipe looks unique and delicious, I can’t wait to try! Our very first party as a married couple featured Fish House Punch (with lots of alcohol) and a guest list of 30. Now we throw parties for 100 or more people. The more the merrier is our motto! We made red and white sangria last 4th of July to entertain and it was so refreshing, not to mention visually appealing. I will have to give your recipe a try next time I’m in the mood for it or entertaining, which might be soon! Wow I need to come to your place to party that sangria sounds amazing. So much more exotic than mine which is to basically throw some chopped fruit into some wine & brandy. Deb, I love the fact that you both churn out great food from a tiny kitchen and are willing to entertain 17 people in a small apartment! Some of the best cooks I know have the simplest and pared back kitchens like yourself, which proves that $1,000+ All-Clad Cookware Sets, eight-burner Viking ranges, and $16,000+ Sub-Zero refrigerators does not make a cook. Passion, a love of food, and simple kitchen essentials do (I blogged about those recently – http://mreverydaydollar.com/the-shockingly-simple-kitchen-essentials). On the topic of entertaining and living in small spaces, I suggest everybody check out Graham Hill’s SoHo apartment (also an experiment in crowdsourced design), that packs 1,100 sq ft into 420, at http://youtu.be/XYV0qATsyts. It’s inspirational for those living in tiny spaces! Talk about signs! I’m planning a dinner party in my own small Brooklyn apartment this weekend, and I’m looking for sangria recipes! I’ve totally asked for a fork at parties where sangria is served. I’ve thought about repurposing fondue forks, actually, to serve in sangria glasses in place of straws. Fondue is so rarely served anyway that those cute little pointy forks might as well get some action. I also read that article on sangria in the NYT! Can’t wait to try the recipe. If there’s a spoon around, I’ll usually use it. If not, I just wait until no one is looking (or at least, I hope they’re not) and then try and eat all the fruits and berries by basically emptying the glass in my mouth. I love sangria! It’s always great to find new recipes! one third red wine, one third orange juice, one third soda water. Sounds ordinary, but I’ve seen a guy at the local market sell it by the truckload on a hot day! I don’t know about anyone else, but I don’t think those San Pellegrino’s are “less sweet”…. I bought one once and it was the absolute sweetest orange soda I have ever tasted in my life. That being said, this post was AWESOME and took me on a journey to learn about entertaining… which, at 22, I’ve never done yet! HI! recipes look fab and delish. my husband is from Madrid and my mother-in-law has a simplified version of sangria every day at lunch- they call it “tinto de verano”. love it! just because you asked, Spanish people never eat the fruit. Don’t know why! just something that isn’t done I guess… they are really missing out! I like yours, maybe too much alcohol for our lunchtime (we love sangria at lunchtime but we don’t add brandy nor any other alcoholic drink) and perfect for night party. drink wine from the melon with a straw. you can definitely eat the fruit with a spoon. Cannot wait for the weather in England to be warm enough to make these! Deb! I LOVE your blog so absolutley. Now that I’ve gushed, I love these recipes. And I ALWAYS eat the fruit from my sangria glass, manners be damned. Wine soaked fruit is a dessert, right? ah, sangria! perfect for the long weekend! Your sangria is perfect idea for this holiday weekend. I’m sitting here at work reading your blog and want to just head home right now and make the delightful beverage. Alas, I will work my day of work and reward myself when I get home. I, like Laura Jane- comment #6 – am a schlurper of the fruit. I figure if people are going to go for the sangria, we’re all going to be figuring out how to get to the fruit. Really, who in their right mind leaves behind alcohol soaked fruit? I think a straw is a great idea. How about coffee stirrers? If you’re serving sangria in small cocktail party cups (especially if you’re hosting 17 people and you’d like to make the beverage last), you can use coffee stirrers to stab the fruit and then it might not look so funky. With the fruit thing on sangria, I remembered a small restaurant in Guadalajara, Mx. where you ordered horchata and got a big glass of it with small pieces of cantaloupe, pecans and ice cubes. It was served with a long straw and an equally long spoon. It was really good, its been years and I can still remember the look and the taste of it. Horchata is a very refreshing beverage made with rice or barley and almonds or nuts. I really like your site, I’ve been cooking and baking some of your recipes they have all been so good!! And I have so much fun reading you too, I thank you, my kids thank you. Sorry to say that, but theese aren’t recipes for a Sangria. I’m from the land of Sangria and theese are called “Zurra”. It’s the recipe of sangria for tourists. The real sangria doesn’t have any spirits in it, no Triple Sec, not cognac, no vodka no nothing. It doesn’t have any sodas in it. The real sangria is wine, sugar and fruits (peaches, apples, apricots, strawberries, oranges, melon…). Leave it in the fridge for a couple of hours and serve with ice on it. As simple as this. Funky and fun toothpicks are your solution. Go to a party store and get cute ones that hook onto the glass but have pointy ends….think like the umbrellas. Festive way to let guests stab their fruit and eat it. One of my good friends makes the best sangria every summer. I think she said the recipe is from Wolfgang Puck, although I’m not entirely sure. When she serves her sangria, there is always a cup of toothpicks nearby to pluck out the booze soaked fruit. I just had a thought – reading comment 130 (JoLayne) that one option could be – if you’re adding the fruit just to the glass anyway – why not make wee fruit skewers? I remember your posts on visiting the North Fork. Did you go on any wine tastings while you were there? I grew up out there, but live in Mass. now. I always look forward to checking out a few wineries during my trips there. Christine — Yes, we’ve probably been to most of them because we’ve gone out four summers in a row. I really like Shinn, Anthony Nappa and it’s really lovely to spend an afternoon at Sparkling Pointe. I have been absolutely itching to throw a dinner party, and so far I’ve been getting the same push back against them from my boyfriend. Our apartment is too small! Our kitchen is smaller than Deb’s! I don’t want to clean up! Pshaw.To which I reply that at least we have hardwoods instead of carpet, and if Deb can do it so can I. I now have this post and am buying that book today to use as weapons. Thank you for your timing! I’ve never been a huge lover of Sangria, but perhaps the less sweet, cloying version will sway me. The peach version sounds divine. My boss is friends with Susan Spungen and just brought What’s a Hostess to Do? into the studio the other day, after the book signing party. I’ve been dying to thumb through it ever since, it looks like a goldmine of great hosting info. Since I also love Sangria I can’t wait to try out both these recipes! Thanks! However! [The fun part!] I do indeed have an extra copy of this book and I’ll mail it to the first person who emails me (thesmitten/gmail) after reading this. (I’ll update this comment once I get an email to let you know not to bother.) Hooray! Thank you! I love sangria. There are two Mexican restaurants here in town and one of them has FABULOUS sangria. The other one puts cranberries in their white sangria. Nuff said. you’ll be pleased to know it’s mostly dominated by kitchen goodies including heath ceramics, the classic stand mixer, and a beautiful set of all-clad cookware – fingers crossed it all makes its way to my kitchen. I’m so excited about this post. I LOVE Sangria! Thank you! I’m getting ready to check out the Rhubarb Snacking Cake as I have an enormous plant in the yard and am always on the lookout for new recipes. Your blog is one of my very favorites! Sangria is always my go to for summer get togethers. For my standard I soak the fruit with triple sec and use half a can of oj concentrate instead of juice either the might before for an afternoon BBQ or the morning of for an evening shindig. Right before it’s served, just pour in wine. I have found other methods that include seltzer or juice things get watered down. It’s definitely a powerful drink. For the best white sangria I used berries (blueberries and strawberries) for red white and blue sangria–did I mention it was for a Fourth of July BBQ? The least-messy, most effective way to eat all the boozy fruit in sangria is with a fondue skewer! I don’t know if that’s the right word for it, but you know what I mean…the two-pronged, long forky guys that come with fondue sets. They’re long enough to reach the bottom of any glass (helpful since I drink sangria by the pint), and not heavy enough to tip your glass over if you get lazy and stick it in your cup for safe keeping. Combination Mushroom-Bolognese Lasagna — Yes! So, I’m going to give it a better edit and create a PDF that I can email back to folks who have emailed to me, or just post the link here. It sometimes takes me an hour to knit two recipes into one, I’d love to save you all the trouble. Oh my, looks great. Handy recipe! I once had to make a pitcher of “Mudder’s Milk” which, as any Firefly fan will tell you, is canonically supposed to be disgusting. I no longer remember exactly what I put in it, but I ended up with a delicious concoction with a sinister chocolate-milk-like appearance. It also included handfuls of fresh cherries which, when marinated in space!Long Island Iced Tea are AMAZING. Um could not agree more with what you said about sangria being served with a spoon or a fork to fish out the fruit! I boldly just go in their and awkwardly fish it out with my fingers. I made a not-as-awesome sangria some time ago, but had the brilliant idea of having skewers of fruit instead of all the loose fruit sloshing around. I made it all in a pitcher with the skewers marinating, then popped a skewer in each glass. It would probably work better in a punch bowl, in hindsight, but the skewers worked amazingly well. I’m hosting a tapas party this weekend, and I’ll be making a Rose Sangria with some 2011 rose that isn’t quite the freshest anymore. I’ve heard that kiwis brown when you include them, but I love the idea of kiwi green in a pale pink punch! Anyone know if this is true? i made your grapefruit pound cake with olive oil and brought it to work today…it was a hit…i have also made ina’s lemon pound cake many times and was excited to try your variation…thank you!! Hi Deb! I would love to get a copy of your document to make both mushroom and Bolognese lasagnas. Thanks for sharing! I found a nice Spanish bar in northern Japan (of all places) and we became addicted to their red and white sangria. The fruit in the red sangria was mainly citrus and berries. The white sangria had peaches, apple, and lychee, which was really interesting. More than thirty years ago my husband and I gave a large party in an apartment with a U-shaped galley kitchen where the side next to the dining area was just a counter into which the sink was placed. I filled the sink with ice and bottles of various drinks. I served food and suitable wines in: the living room red wine, guest room white wine, and dessert/liqueurs on the dining table. People put their coats on our bed, and picked up a plastic glass on which they put a sticker with their name on it. I explained that there was nowhere to put a glass down. There was a map on the wall showing what food and beverages could be found in which space. Used the ironing board in the spare room, coffee table in the living room, huge pot of chili on the stove as well as coffee after dinner. It worked! Reading your account brought back memories–and I know our guests would have been overjoyed had they been served your lasagnas! There’s a really great gin bar in Chicago that serves warm cookies at midnight! You would love it. OMG Deb I was just thinking about Sangria on the drive home yesterday. I’ll have to give your recipes a try next weekend as my husband is out of town for Memorial weekend, sigh! it’s just sad when you make Sangria for one…plus it sets a bad example for the almost 20 year old home from college, although he does drive me to drink. ha ha! (might just have to throw some fruit into my wine tonight!) I’m so glad you were smart enough to get all the Stella Iitala’s I have a set of 8 wine glasses and have been kicking myself for years for not buying all at the time. I check Replacements Ltd. frequently hoping but sadly no. Anyway we use these as our Sangria glasses and we just dig out the fruit, Yum! thanks for your great sight and cookbook, I’ve given it a few times now as gifts, always well received. I use chopsticks to eat the fruit! The only thing you’re missing is a tiny bit of cinnamon! I studied abroad in Granada in college, and my host sister’s recipe was almost identical, but with several dashes of cinnamon. Not so much that you really taste it. Just enough to make you think, ooh, what is giving that warmth and depth? Also, once you add sparkling water/soda to sangria, it’s called “tinto de verano” — the color or “tint” of summer. I’m pretty sure I just make an undignified mess. Fruit soaked in wine? I won’t let it go to waste! I’m curious about the “knit together” phase. In the fridge? Surely on the counter is not right. What’s your experience? Oh no! I thought using orange (and lemon) San Pellegrino was my secret!!! My dad’s favorite is Sangria, so for every Father’s Day we experiment. Mostly it’s my concoctions of whatever fruit we have on the borderline of being over ripe and cheap Trader Joe’s wine (real talk). But this. THIS looks like something he deserves for Father’s Day. As for the eating of the fruit, it’s always an awkward tipping of the head and glass too far back, hoping it all doesn’t come plummeting toward my face. Or like you, and depending on the company, just going in with my fingers. Maybe cute party skewers/toothpicks? Love sangria – best summer drink! It was also a great way to get myself into drinking wine! I just recently read your book and wanted to tell you how much I enjoyed it. It’s such a pleasure to read about how it all started for you! Ah Sangria days are here! Have made sangria for decades for time in the porch swing, time with girlfriends, for dinner with the Mister, just becasue and you are right~ that fruit is luscious. After a couple of messy encounters becasue we weren’t going to ‘leave’ the fruit… I began making fruit spears as well to dress the glass. It works wonders for strirring the fruit while you talk and provides a delivery strategy for gettig the fruit from the bottom of the glass to the lips! Fresh fruit on a stick vs the wine soaked fruit in the Sangria… makes for a happy contrast. Viola! Your post reminded me of one of Erma Bombeck’s pieces, “If I Had My Life To Live Over.” It’s was gives me the courage to entertain when nothing around me is perfect! Everything sounded so fun – you gave your friends a great night and a memory they’ll have forever! These both look perfect! Nothing is better than sangria in the summertime! My favorite NYC sangria is at Sevilla, an old-school Spanish (heavy on the garlic) restaurant on West 4th St. & Charles in the West Village. I can and have drank an entire pitcher by myself. Those were the good old days. Not so keen on floating pieces of fruit in my sangria. Me, lots of ice, sort of sweet, a little fizz = nectar of the gods. Can’t wait to try the sangria recipe! And thanks for the reminder that homemade chocolate chip cookies are a fab dessert (and easy)! Can you tell me where you purchased the linen tablecloths shown? Took the second one for a spin this weekend and it was GREAT! In fact, I fed it to a party and it went over well. And best of all, it was not too heavy and not too boozy. An excellent summer choice when you don’t want to be too concerned about your mouth watering at the thought of a second glass. . . .thank you for an awesome receipe! Maybe some brilliant person already suggested this ( I can’t read all the comments as I’m supposed to be working), but what if you skewered the fruit on cocktail spears before soaking or adding. Easier to get to, less messy to drink (the fruit always makes me spill) and eat. Plus then everyone gets a mix of fruit (I always seem to end up with only one kind in my glass). Anyway, I’m going to do cherries in my sangria this year. That just makes sense to me. Completely off topic, but I had a question– bought your cookbook (LOVE IT!) and want to make your s’more layer cake….. but I don’t have a blowtorch. Is there any other way to finish off the cake? Can I broil it? light a candle near it? A bit stumped, thanks! Hanna — I haven’t broiled it because my broiler is useless but I suspect you could. Just real quick. The recipe is almost exactly the same as a meringue topping for a pie (I’ve since learned) and those are usually run under the broiler without a problem. I LOVE Sangria!! So funny you posted this today, because literally 2 hrs ago, I made a huge pitcher of Sangria! I am preparing for my Mother’s visit. (don’t judge, she’s tough! LOL). I love your blog and your book and I look forward to your blogs. Thank you. thanks for sharing the second recipe! definitely more my speed to simplify. i would make sangria every week in the summer if i remembered to buy ingredients. i came pretty close last year. We are heading into winter at the moment but happily it’s still warm enough to follow your recipes and also to have some good friends around to share with us. I just have to give mad props to anyone who can host 17 people for dinner. We’re not worthy! I made this for our Memorial Day dinner-on-the-patio summer kick-off party and it was a hit. I used the less sweet recipe with a Rioja, it was delicious with ribs, grilled corn and “Not Your Mother’s Coleslaw”. Sangria is not one of my favorites but yours look so delicious I couldn’t say no to it. So regarding the fruit eating: I have also had that incredible white wine with peaches in Italy. They kept the peaches in the pitcher, refilled it with new bottles of cold white wine all night (did I mention that the meal lasted all night? ), and eventually came around with a spoon, told us to “drink up!” and then scooped half a wine-soaked peach into each of our glasses for dessert. I believe they gave us small spoons for this dessert course, though who can remember after a meal like that. Also, you might like my family’s go-to dessert. After dinner on any old night, we would slice apples into the last of the red wine, and then eat the wine-dipped apple with a few slices of sharp cheese (often already on the table from whatever pasta we just finished eating). Fork for the apple. Fingers for the cheese. I live in Spain with my Spanish husband and he makes a sangria that never fails to wow the crowds at parties in the States. It’s not so much of a recipe as throw things together until they taste right, but the ingredients are: red wine, orange juice, a carbonated or sparkling beverage, fruit, a bit of sugar, and the two secret ingredients: cinnamon and whiskey! Sangria is awesome, particularly with white wine in the summer. Had one with lychees a couple months ago that was brilliant. I love a good, cold glass of sangria on a warm day. I also enjoy it for grilling parties. Maybe it is how festive it looks, but I feel fruity wine always gets a party going. I have even grilled the fruits, chilled them, and then added them to the wine. Adds a lot of sweetness and is lovely for a grilling themed dinner. Wine solves everything! Yes, it does. Too-sweet sangria reminds me of peeling my sunburned friend up off a Barcelona beach, but I love fruit-filled, not-too-sweet sangria like these. Somehow I’ve never tried making my own. It’s time! What? The Spanish sangria recipe serves the fruit on the side? What? Who? I don’t get it. Side note, you’ve inspired me. I was wanting to throw a baby shower for a friend and afraid to do it in my 1,500 sq ft abode. If you can do it, I can do it! Here’s a small space tip – those IKEA folding chairs store flat hanging on the wall :) I installed a floating LACK wall shelf at counter-height which serves as a buffet when entertaining and hung 4 folding chairs beneath it on hooks to pull out for extra seating. I wanted to make your chicken Caesar salad, but when I went to look for the recipe on your site, I found it to be incomplete. Is there a complete version someplace that I’m not seeing? PRO TIP: to keep melting ice from watering down the sangria, use frozen fruit instead of ice cubes! blueberries look best in white wine or rosé/rosado sangrias; frozen raspberries or blackberries tend to do well in red wine sangrias. Loved this piece on entertaining in a small space, as I too live in a very small apartment and often get the entertaining bug, but worry about space issues. I have recently been making small changes to my apartment so that I can accommodate more people. One thing I did was purchase 1940s drop leaf table, perfect for two on most nights, but can fit up to six when opened. With a few of the folding chairs from IKEA, this may be a perfect solution! Thanks for inspiring me, and for the entertaining tips! I’m a sangria nut as well. I make mine with a can of clear lemonade instead of adding sugar. I’ve never posted a comment on your blog, though a frequent reader, but had to thank you for the uncanny timing of this article. Last night I hosted a tapas themed party which an overwhelming number of people had said they could make it. Your article made me feel better when I read it last week, as I was feeling very anxious when I knew to expect 36 people in my one-bedroom Chicago apartment. The sangria was a hit as was the crowded by lively party! That nytimes sangria article was wonderful!! I made the sangria with white wine and loved it. Absolutely loved it. I was deterred by the massive ingredient list for the Pata Negra one, but I shall have to try it, as I love dry wine! So my friends and I up in Boulder have been following this website for years. We’ve bought your book, made a ton of your recipes, and thank you for the evenings when we can break away from the engineering school/labor that are filled with laughter, great food, and excellent company. I have never made sangria, nor have I really ever had it. This recipe is great because it leaves enough room for personal fruit/berry selections and ratios. The recipe nails the alcohol ratio base perfectly and I decided to smash up some raspberries, blueberries, and red cherries. The drink was superb! Thank you. Great post! Where did you store the cookie dough before you baked it off? Did you put it on trays and freeze it or seal the dough in an airtight container in the fridge? I want to do this for my next party. Gretta — I’d hoped (just for ease during the party) to scoop it on trays that I could just slide in the oven. But, my fridge laughed at this idea (it is small and was overstuffed for the party) so I just kept it in a covered bowl until it was time to bake them. Oh… this sangria looks perfect for the Summer! Seeing all the banter about white wine sangrias, I think an idea fruit combi would be peach, blackberries, and apples!!! Mmmm, now I have a craving. I serve sangria with little bar umbrellas, which double as fruit-stabbers. Not everybody’s cup of tea, but I LOVE the fruit and don’t want people to feel weird about eating it. I just found your web site and already feel so far behind! I can’t wait to read your book…. Maybe with a glass of Sangria would be nice! I have a lot of catching up to do but I think I will start with the Lobster Mac and cheese, Berry Bundt cake and this Sangria? Luv the pitcher and glasses where did you find them might I ask? Thanks! Looks so refreshing and delicious!!! I tend to shoot the fruit. At the end, like a shot of tequila. Just dump it back with a flick of the wrist and chew, depending on the fruit to cocktail ratio you may need to make a few shots out of it, but it always works for me and I notice that no seems to think of it as dignified or undignified, just finished the drink. It is ALL in the wrist though. Great recipes as always! So glad for the second sangria recipe – it makes my husband’s fast sangria seem more legitimate! Similar to sandy’s comment it is 1.5liters wine, 1 liter orange soda, .5 cup brandy or triple sec, and apple and an orange! I really like sangria…especially for large amounts of people. There is a really good syrup that you can use in place of sugar. Its Monin mix flavoried Red Sangria. They also make White Sangria as well as many many other flavors that you could use in coffee, teas, and cocktails. Another variation for summer is to use peach cranberry juice, white zin, peach vodka, and orange liquer. Also, add some spice to the Red Sangria with a dash of cinnamon. I experiment adding any juice really to various wines to make them a little different. I love your recipes…and am quite addicted to reading them for hours :) thanks! 20+ years ago, I splurged on a set of flatware for twelve. I chose that particular set, because it contained both seafood forks and iced tea spoons. I didn’t really plan to serve a lot of seafood or iced tea, but simply loved the look and the “idea” of them. I’ve since upgraded my flatware, but I’ve hung on to those particular spoons and forks. I use them for many things (the spoons are terrific for less-than-smooth smoothies), but now I’m envisioning those same spoons in glasses of sangria! The seafood forks might work, too, depending on the size of the glass. I’m not necessarily shy about sticking my finger in a glass to chase after a piece of fruit, but red wine makes it so much sloppier, what with the potential for stains and all. Straws can work, but they can break or bend. My co-workers and I love sangria and at almost every summer get-together, we try and exchange new recipes for it. I’ve also considered taking the remaining “boozy fruit” from the empty sangria pitchers and pouring it over ice cream… That may happen this summer, too. At your recommendation, I went to Pata Negra last night to try the sangria and you are absolutely right.. it is the PERFECT glass of sangria. Thanks for the suggestion! The classic sangria recipe sounds right up my alley. I have been known to stick a fork in my sangria glass in restaurants to get to the fruit on the bottom- we can’t let that stuff go to waste! Sangria Fruit Management skill : once all the liquid is gone, I use a straw to gently nudge the fruit up to the top of the glass. Then I simply bring my mouth to the lid and pop it in! Slightly more graceful than using fingers. So good. There needs to be a Smitten Kitchen app. Seriously. Thanks so much for passing along the recipe for the restaurant sangria. It is positively delicious! I made it for the 4th of July (not super traditional, but hey, it’s hot here in Virginia and it was perfect!). Your site is fabulous & thank you for taking the time to share it with us. Cheers! i´m a follower of your blog almost for 2 yeas but i never comment!! i´m from Portugal and i have a secret for white and red whine or even rosé whine. you have to experiment mint leaves in sangria. To red whine you could try to add 1 or 2 cinnamon sticks per 1 lt. These recipes sound delicious! My husband and I recently had our kitchen renovated and we now have a small but gorgeous bar area. We are not big drinkers but we are hoping to learn how to make and serve interesting cocktails. 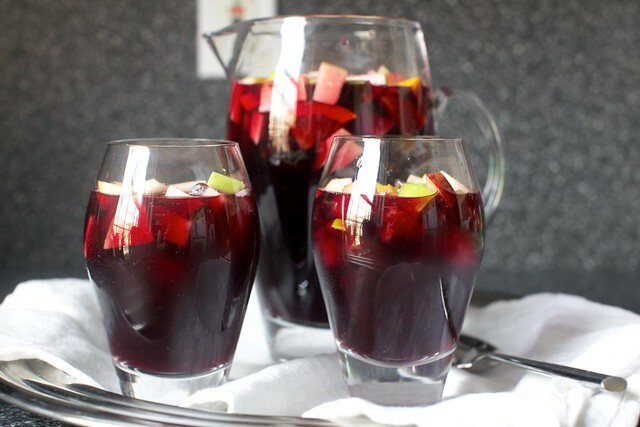 Sangria is already a favorite of ours, and I appreciate the authenticity of these recipes. I’m always on the lookout for combinations that are like the sangria I enjoyed when I lived in Spain, none of which ever contained carbonated beverages. These might be just what I’m looking for. True Sangria from Spain does not take sugar and most places that I had Sangria from Spain used Fanta. ( I know lots of sugar in that) But no additional sugar. We like sangria :) Your recipes sounds great. I make this for our block party every July 4th, and it’s always a hit. If you don’t like sweet sangria, you should check out the recipe for Madrid Sangria in the Barbeque Bible. So good…and so boozy. Yum. My favorite local sangria soaks their apples and pears in brandy before adding them to their sangria, so you bet your boots I fish those things out. Very unceremoniously… with my straw. I regret nothing. Sometimes I wish I had a skewer. Oh no! Came here seeking your genius lasagna dinner party PDF instructions but the link is broken. Help help! Thanks for emailing me — now fixed. Appreciate the heads up! Gorgeous drinks! I love the addition of peaches in the first! Serve steeped, skewered fruit in a vase of sangria for the glasses. The fruit in the pitcher is for the pitcher..